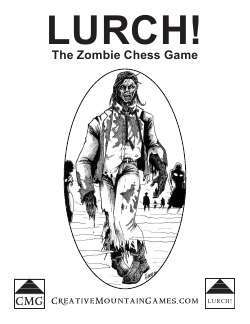 Lurch is a basic beer and pretzels game based on board games like chess. It uses a standard eight by eight square board and fold-up miniature figures, pawns or markers, to denote the individual units. The Basic game is simple, and there are Advanced rules to increase the complexity for seasoned players. There are also over two dozen additional scenarios to add replayability and fun to the game. An additional section explains ways to use the game within your roleplaying game as well. This game is complete and includes Basic Game Rules, Advanced Game Rules, over two dozen Alphabetized Scenarios, dozens of paper miniatures and markers. Playouts are layouts to be printed and used at the game table during play. In this PDF, you will find a small keep. It is four stories high with a sub-level that includes storage space and cells for prisoners or beasts. Consider the staircases somewhat fudged for use with a five-foot equals one inch grid. One could claim this keep has a garrison from one dozen to three dozen guards, if one considers the beds as bunk beds and assumes that those on duty give up their beds to those who are not. The artillery is somewhat downsized from the great siege machines and meant to be akin to spear-throwers. The final two pages include a blank background and Playouts bits in case you wish to add to the keep, change a few things around, or build something of your own in the same style. This small keep is perfect as a roadside toll collector, a starter-stronghold for up and coming PCs or even as a wizard’s tower of sorts. A GM could also claim it has long since been abandoned by civilized folks and now must be scourged of evil creatures. This series of five encounters make use of a cunning 3rd-level Kobold Barbarian and his trap-making ability in a woodland setting near three small communities. This new 18 page pdf features high-resolution Playouts (maps to be printed up for game table usage) for five separate encounter areas plus a bonus blank map with extra bits and pieces so that you can design limitless additional areas in the same style, or to expand the areas already detailed. Can you steer your ship by the albatross? Do you dare to wear the Boar's Tusks of Goblinoid Slaying? Will casting the Shark's Feeding Frenzy on your companions save their skins? This 32 page pdf takes many real world superstitions and gives you tips on how to use them in your game. Nearly one hundred Magic Items, Spells, and Advanced Creatures are included. Need a quick cohort, some ready-made miniature thugs, or even a main villain? Will adding a few details and adjusting the gear or wealth save you time when someone shows up without a PC ready? Your time is valuable and this batch of NPCs will save you hours of busy work. Just add a tad of flavor, print one out, then plug and play away! Grab a FREE 20th-level version of the Halfling Rogue NPC in the Demo. (Demo is "locked" but product is not. Plus, the product is form-fillable!) The eConic Characters - Halfling Rogue NPC is for you! Here is the indispensable PDF of forms that will grow even more useful with time. These sheets were built with adaptability in mind while not sacrificing a compactness that makes tidy record keeping a cinch. A two-sheet solution for non-casters is the first thing to greet you. That is backed up with a single blank spell sheet that can be used for young spellcasters, multiclass characters, or on its own as a spellbook, for when a GM wants to easily hand over a captured tome treasure. All of the base spellcasting classes then have their own sheets with room to add researched spells or new ones introduced to the campaign by the GM, of his own devising or from additional sources. You'll also find summoning lists for Nature's Allies and for Monsters. Just use the sheets you need and expand your character with additional sheets as needs be. If you do not have the full version of Adobe Acrobat you can now save filled in forms with Adobe Reader 7.0 or newer! This is the best and easiest way to keep your character records.